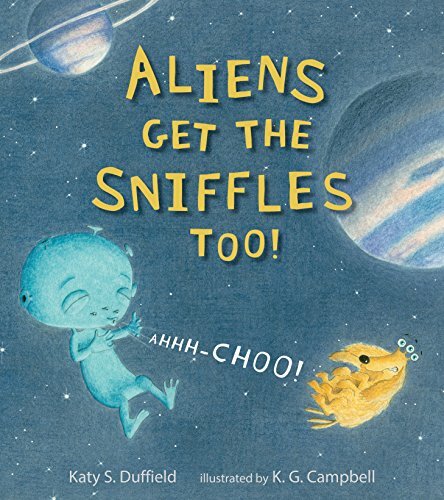 a book review by Susan Middleton Elya: Aliens Get the Sniffles Too! Ahhh-Choo! The title gets your attention. Little Alien is sick and needs his parents’ love to get well. The image of a sick alien with two throats, five ears, and three noses is just gross enough to appeal to kids. The dog, Mars Rover, is hilarious. The lunar decongestants are disgusting. In the end the dog catches what Little Alien has, and the whole thing starts over, much like flu season. The art is colorful and fun. K. G. Campbell’s purple, pink and teal palate with bursts of greens and oranges is perfect for the alien world. Mars Rover could only be yellow gold in this fantasy. Pops of black and navy-blue work well. The solid teal end papers are a different choice where stars were expected. The cool meteor shower has a clever drawing of meteors actually coming down through a hatch in the ceiling. This double entendre works well. Others that don’t work as well are the asteroid belt (on the dog). The story has lots of plays on words that will be appreciated by the reader, the parent. Some of the jokes that work are the sneezes, such as AHHH-flying-saucer-choo and AHHH-3-2-1-blastoff-choo. The Milky Way milkshake is a cute pun. A Little Dipperful of water and a pinch of stardust are acceptable. A sparkling blanket of stars is sweet. Once the dog is tossing Saturn’s rings on Little Alien’s ears, the fantasy world of sick alien children becomes less believable. Mars Rover leaping from the glimmering crescent moon is problematic. Is this one of Jupiter’s twenty-three moons or one of Saturn’s fifty-three moons? It just says “the moon,” which implies it’s our moon, the Earth’s moon. The Earth’s moon couldn’t be up there with Saturn. At least that’s what some budding astronomer will think when he or she sees this page of “the moon” and Saturn in the same spread. If there would’ve been multiple moons, it would’ve gone with Saturn and Jupiter. This is the kind of thing a writer must fight for with an editor, to keep the fantasy world believable. Jean Piaget, a pioneer in studying children’s cognitive development, tells us that abstract thinking doesn’t begin in children’s brains until they are about 12 years old. Double entendre jokes rely heavily on a person’s ability to use abstract thinking. If the book is for older kids, they will enjoy the puns. Amazon says the book is for three to seven year olds. The little ones won’t get the jokes and will wonder why they only have one nose instead of three. For them the sound of the language will be fun, but the double meaning s will be lost. Older children will get some of the plays on words but might question the believability of some situations, even in a fantasy world. Parents will appreciate the jokes as they read it over and over again. Children everywhere will learn the word decongestants. That makes this book unique for that reason alone.